The AquaMate VS is a control system designed specifically to work with the Pentair IntelliFlo VS pump, which is available exclusively through Pool-Water Products. 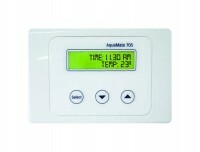 With many similar features to the AquaMate 705, including pool & spa programming and heater control, the AquaMate VS allows for the convenient automated control of the day-to-day operation of your pools system whilst allowing for all the variable speed programmes made available by the IntelliFlo VS pump. Aquamate 705 is the easy, trouble-free way to operate your pool and spa combination – anytime – in an instant. With its’ indoor panel, AquaMate is designed to give you the ability to operate your filter, pump, heater, and spa circulation valves. It has built in programming for filter pump, auto chlorinator reduction in spa mode, and even an optional water levelling device.The Aquamate 705 takes care of the day to day operation of your filtration system. With more than 200 builders around Australia it’s easy to find one near you.